Happy 30th Birthday Macintosh - Sewelltech, Inc.
Thirty years ago, Apple introduced the Macintosh with the promise to put the creative power of technology in everyone’s hands. It launched a generation of innovators who continue to change the world. 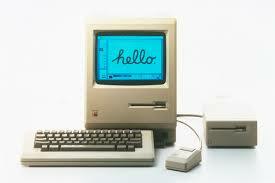 From everyone here at Sewelltech we want to wish the Mac a Happy 30 years! With out you, where would we be today. Lets take a look at why the Mac has been a great computing platform for 30 years. The Macintosh 128K, released initially as simply the “Apple Macintosh” (without the 128k designation), is the original Apple Macintosh personal computer. Its beige case contained a 9in monitor and came with a keyboard and mouse. A handle built into the top of the case made it easier for the computer to be lifted and carried. It had an initial selling price of US$2,495. The Macintosh was introduced by the now famous $900,000 television commercial by Ridley Scott, “1984”, that most notably aired on CBS during the third quarter of Super Bowl XVIII on January 22, 1984. Apple put a premium on design. 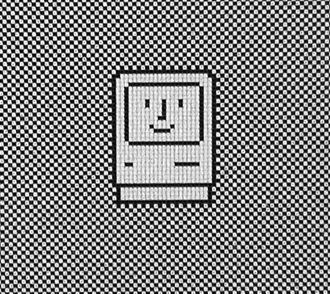 Early Macs showed a happy face when they started up. Icons and windows had rounded corners. Such details made computers appear friendlier and easier to use. While there are a zillion different styles of PC out there, pretty much everyone agrees that the style, elegance, and just plain “hip-ness” of the Mac has yet to be beat. They just look cool, and they’re extremely well made. That’s why you almost always see a Mac in the movies and TV. Ever watch Seinfeld, it was impossible to not notice the Apple Macintosh computers sitting in the background of the stand-up comedian’s apartment. He always had one of the newest models of the time too. Way to keep your stuff upgraded Jerry! Think about this, the Macintosh Team spent 6 months on tweaking the case design of the original Mac to make it was just right. Since the Macintosh team were artists, it was only appropriate that they sign their work. Steve Jobs came up with the awesome idea of having each team member’s signature engraved on the hard tool that molded the plastic case, so their signatures would appear inside the case of every Mac that rolled off the production line. Most customers would never see them, since you needed a special tool to look inside, but they would take pride in knowing that their names were in there, even if no one else knew. The Mac Was designed so people could actually use it. Apple sparked a revolution in computing with the Mac. In turn, that sparked a revolution in publishing as people began creating fancy newsletters, brochures and other publications from their desktops. 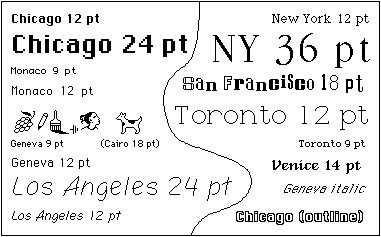 With the sole exception of Bill Atkinson’s Venice typeface, the fonts included with the original Macintosh were designed by Susan Kare, who also designed most of the Macintosh’s original icons. After designing the first few fonts, the team decided they needed to adopt a naming convention. First, they settled on using the names of stops along the Paoli, Pennsylvania, commuter rail line: Overbrook, Merion, Ardmore, and Rosemont. Steve Jobs had liked the idea of using cities as the names, but they had to be “world class” cities. So that is how Chicago, New York, Geneva, London, San Francisco, Toronto, and Venice (Bill Atkinson’s script font) got their names. There’s a culture of very good quality freeware/shareware with excellent user interfaces on Mac — probably a result of Apple leading by example in user-interface design and shareware authors emulating this. Every Mac comes with some very useful apps that don’t come on Windows. Even the first Macintosh had high quality fonts that Windows didn’t have. Today, every Mac comes fully loaded with some wonderful and very useful apps: OS X Mavericks version 10.9, iPhoto, iMovie, GarageBand, Pages, Numbers, Keynote, Maps, iBooks, Safari, Mail, FaceTime, Messages, Calendar, Contacts, Reminders, Time Machine, Photo Booth, iTunes, Game Center, Preview, Notes, the Mac App Store, Notification Center, Dictation, iCloud, Gatekeeper, Twitter and Facebook integration, and more. The teams at Apple that have built and rebuilt the Mac over the years have had the option to toss away anything that didn’t work, and yet so much of the original Mac concept succeeded that, 30 years later, the Mac remains undeniably the Mac. Happy Birthday Mac, looking forward to the next 30 years.